I have a problem... I see these things that I'm not going to have the option of buying anymore and I can't seem to help myself. Oddly enough, I picked this up on a little jaunt to Target on my lunch break, and when I got back and sat down to enjoy a little bit of Youtube while I finished up said lunch break, I was met with a tutorial using this palette. I felt like that cosmically justified the purchase, right? The universe was telling me it was money well spent, right? Anyway, I've used this palette a few times now and I'm ready to give my thoughts. 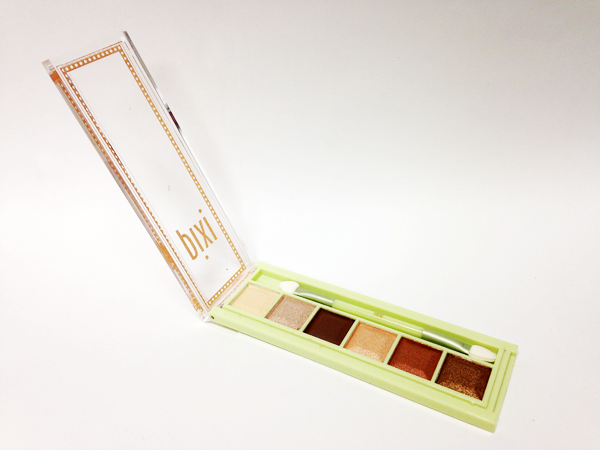 Keep reading for a closer look and review of this palette. Of course, let's talk about the packaging first. I have to say... I'm not the biggest fan of the pale green packaging on the Pixi products. For me, it's just not the prettiest thing ever, no matter how much I love the colour green. The other thing I don't love about this palette is the way the lid swings. The way that this lid tips up longways makes it feel somewhat cumbersome. I much prefer a palette whose lid tips up the standard way. Overall, however, I don't feel like either of these things are particularly bad - just not my preference. As a selection of basic shades go, in the pans these look like a pretty perfect selection of shades. I love a palette that incorporates a good selection of blending shades, lid shades, and coppery/bronzey deeper shades because I feel like this can make for a selection of really great looks. Obviously this is part of why I bought the palette. 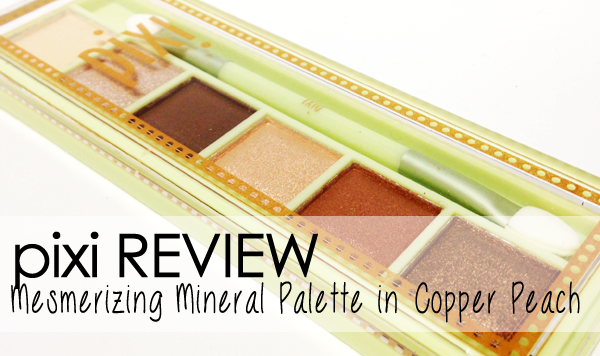 Unfortunately, for me, there was a bit of a lack of pigmentation and consistency in this palette. Now for the shades themselves. I think the satin cream shade on the the far left is a bit of a throwaway. It's a soft textured shade, but it comes off a little bit powdery and all but disappears once you put it on the skin. I'm also disappointed that it isn't a matte shade, because at a glance it does seem like it should be, but there is definitely some sparkle in there. The second and fourth shades in the palette are also a bit of a bummer for me. In the pan, they actually look quite different, but once you swatch them or use them on the eye they're almost exact dupes for each other, with the fourth shade being just a hint warmer. They are both nice shadows with great pigmentation and texture, but much too similar to be 2/6 shades in one palette. The third shade in the palette is pretty much identical in formula to the first one - soft, powdery, satin finish that is lacking in pigmentation. However, this one isn't a throwaway for me. I think it does look pretty good blended into the crease to give some soft depth to that are, but it doesn't deepen up a look as much as one might hope from seeing it in the pan. The fifth shade in the palette is a real disappointment for me, because it was the shade I was most excited about and the one that performs the worst. It's a classic shimmery copper shade, but it just doesn't bring the pigmentation and applies really patchy when you try to build it up. Finally, the last shade in the palette, which is by far my favorite. This deep golden bronze shade packs a lot of punch with the pigmentation, has a creamy, smooth consistency, and blends like a dream. If I could buy this one in a single, I absolutely would. Overall, I don't really think this palette is worth running out to buy. If there was a duo that contained the fourth and sixth shades, I'd be all over it, but otherwise I feel like this is just a bit of a dud as far as pigmentation and performance is concerned - and I don't think that those two shades are special or unique enough to buy this palette just for them. This one, I have to say, is a very pretty looking pass.